Broadening its appeal still further in the luxury saloon and estate car market, Land Rover Ltd today announces an automatic option for the highly successful Range Rover. Providing easier control and quieter performance, automatic transmission gives an added dimension to Range Rover driving, while maintaining its unique combination of on and off-road abilities. The option will cost approximately £600. The Range Rover automatic sees the first application of a completely new heavy duty transfer box developed by Land Rover, combining strength and lightness with smooth operation. Matched to the Chrysler A727 3-speed automatic gearbox, the unit offers the chioce of high/low ratio and the ability to lock the centre differential at any speed and in either ratio. The power unit is the latest specification 3528cc V8 high compression engine. To mark this important stage in the development of the vehicle, the automatic transmission makes its debut in the most luxurious production Range Rover ever - the "In Vogue" Automatic Special Edition. The "In Vogue" Automatic incorporates several new items to enhance the car's luxury appeal. Standard equipment includes armrests and headrests on both front and rear seats, a Philips AC807 radio stereo cassette system with front and rear speakers, and 3-spoke alloy wheels with a special finish. Polished American walnut door cappings with distinctive inlay, full load space carpeting, and a specially designed trim co-ordinated cool-box are also standard. The "In Vogue" Automatic is available in two metallic paint finishes: Neveda Gold - a completely new colour - or Sierra Silver. Each has a subtle side-tape treatment in brown or grey respectively. In addition to the automatic transmission, the improved seating package will be available as an option on 4-door Range Rovers later in the year, along with the new Nevada Gold paint finish.
" The luxury saloon and estate car sector is now more competitive than ever. Automatic transmission as a factory fit option shows our determination to meet the customer's demands for on and off-road refinement. It is logical extension of the philosophy that brought about the Range Rover 4-door.
" 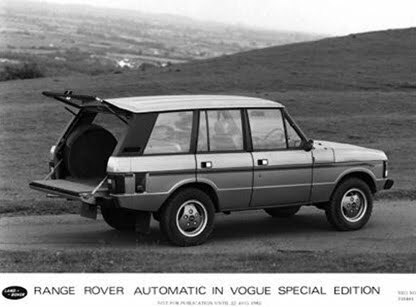 Our decision to mark the occation with an 'In Vogue' edition reflects the demand for a very highly specified version, an approach already proven by the response to our similar exercise on the Range Rover 2-door last year. I expect an enthusiastic reaction once more in the United Kingdom, the Middle east and Continental Europe." The 4-door version has contributed to a significant improvement in Range Rover sales. Compared with the same periode last year, UK sales are up by over 20% in first half of 1982, with the 4-door now accounting for 75% of volume. In equipping the Range Rover with automatic transmission, Land Rover engineers have retained the basic system of feeding power through the main (automatic) gearbox to a two-speed transfer gearbox incorporating a lockable differential. Power is then fed direct to the front and rear axels. The automatic Range Rover therefore retains the important feature of permanent four wheel drive, which contributes greatly to the vehicle's outstanding off-road performance and on-road security. 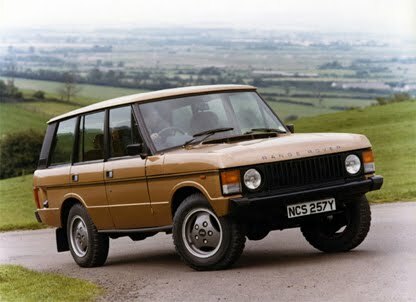 Tests revealed that the most suitable automatic transmission for the Range Rover was based on the Chrysler A727 unit. Gearboxes are bought in by Land Rover Ltd and a number of modifications carried out. These include sealing the gearbox against water ingress, providing alternative venting, and installing a special plate to mate the main gearbox with the engine. A completely new design of transfer gearbox - the LT230R - has been developed by Land Rover engineers and is used for the first time in the automatic Range Rover. The heavy duty, two-speed box combines strength with lightness and provides permanent four wheel drive with selectable differential lock. The high and low ratio options are retained, as is the lockable centre differential, while a considerable reduction in noise levels is achived. Improved driveability and refinement also result from the new transfer box. To meet the higher gearbox oil temperatures encountered in automatic transmission vehicles, a high capacity front-mounted gearbox oil cooler is fitted. As a further back-up, an oil temperature warning light is fitted in the instrument binnacle. Other mechanicals, including the 3528cc V8 high compression engine and ancillaries, suspension and brakes, remain unchanged, maintaining the Range Rover's unique combination of unsurpassed off-road ability and refined on-road performance. 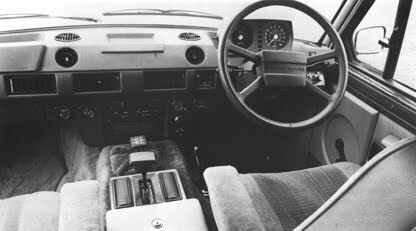 In developing the automatic option, fuel economy was a major consideration for Land Rover engineers. The high compression version of the V8 engine gave improvements in fuel econmy of up to 20% when announced in 1981. Extensive testing has ensured that the Chrysler gearbox matches as closely as possible the power characteristics of the V8 unit. A conventional six position gear selector is mounted on the transmission tunnel, with the gears laid out in the usual manner (P:R:N:D:2:1). An unusual feature is that the gearchange from 1 to 2 is positively inhibited to eliminate the possibility of accidental selection during off-road driving. The transfer box control retains the High-Neutral-Low layout, but in the Range Rover automatic the same control is also used to engage the differential lock. This is achived by pushing the lever to the left in either high or low ratio.